Canada Day (which will be our country’s 146th birthday this year) is coming up on July 1st – yay long weekend! 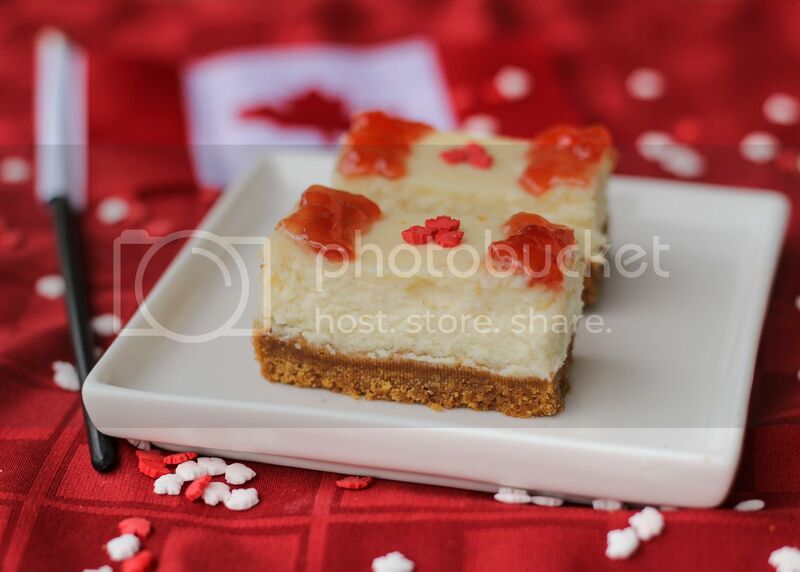 I love coming up with recipes for Canada Day because there aren’t really a lot of ideas out there (especially compared to the number of red, white, and blue recipes!) so it’s easy to be creative, plus we’re lucky that our flag is fairly simple to represent using food because it has only two colours - red and white. 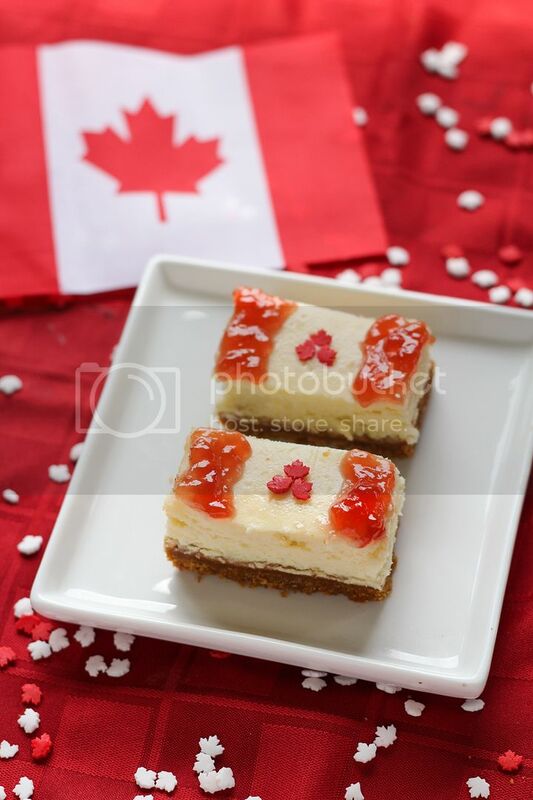 One idea I had last year but never had time to try was to make plain white cheesecake bars and top them with strawberry jam to create little Canada flags. So I decided to give them a try this past weekend for a family get together, where I knew there would be lots of people to help me eat them all! Plus my cousin is about to leave Canada for a few years, so Canadian flags were very appropriate! I was a little behind in trying to finish and photograph these before I had to leave, so they were done in a bit of a rush, but I was so happy that they turned out just how I’d imagined in my head! The filling for these bars is plain vanilla cheesecake that’s rich and creamy (and didn’t crack at all, which I was thrilled about!). 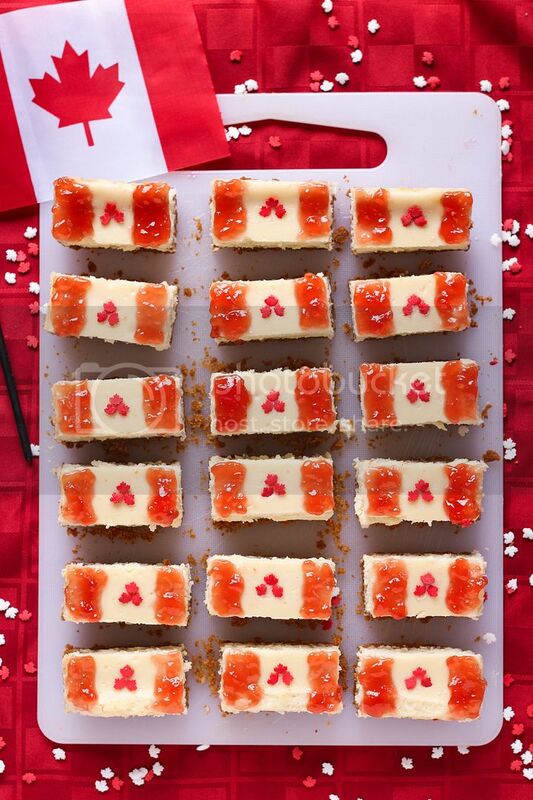 Once I sliced it into bars, I just spread strawberry jam on the edges and placed maple leaf quins in the center to resemble the flag. The quins (like these) are available at Bulk Barn this time of year, but if you can’t find them anywhere, you could just use more jam or another type of red sprinkle arranged in the shape of a leaf. I got lots of compliments from my family on these bars, and I think they would be the perfect treat to bring to a Canada Day gathering this weekend! Line an 8-inch square baking pan with aluminum foil, leaving a few inches of foil draping over the sides of the pan (which will help with removal later). Make the crust: Whisk the graham cracker crumbs, brown sugar, flour, and salt. Pour the melted butter over the mixture, and stir together with a fork until all crumbs are moistened. Transfer the mixture into the prepared pan and press evenly to form the crust. Bake in preheated oven for 12-15 minutes, until crust is beginning to brown. Transfer to a cooling rack to cool for about 30 minutes. Meanwhile, prepare cheesecake filling. In a large bowl or bowl of an electric mixer, beat the cream cheese until smooth, about 3 minutes. Beat in the sugar until well combined, about 1 minute. Beat in eggs one at a time, fully incorporating each egg into the mixture. Beat in sour cream and vanilla until fully combined, about 30 seconds. Pour mixture over cooled crust and return to oven. Bake for 35-40 minutes, until edges are set but the middle jiggles slightly (as a whole) when you shake the pan. Transfer to a cooling rack and let cool to room temperature, about 2 hours. Transfer to a refrigerator (I don’t cover mine because I find the cheesecake ‘sweats’) to cool completely, for at least 3 hours or preferably overnight. 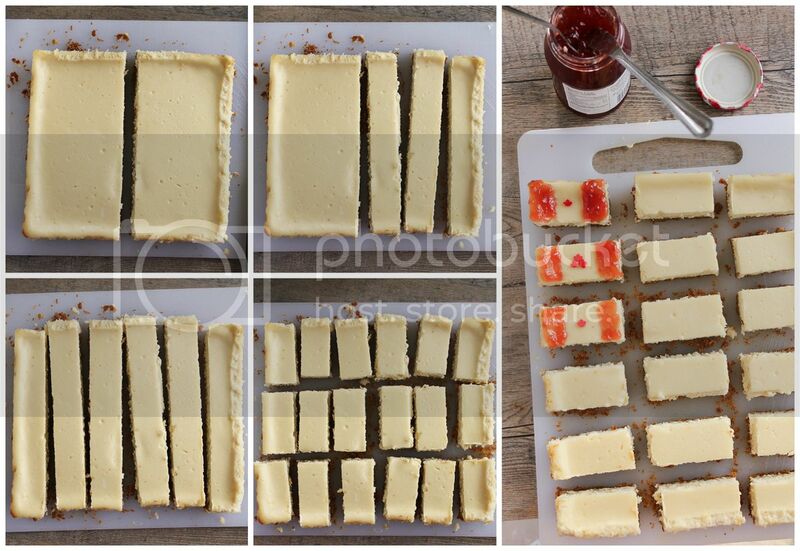 On the day you will serve the cheesecake bars, use the aluminum foil to lift the cheesecake out of the pan, then slice them into 18 small rectangles (6 columns and 3 rows - see picture below). 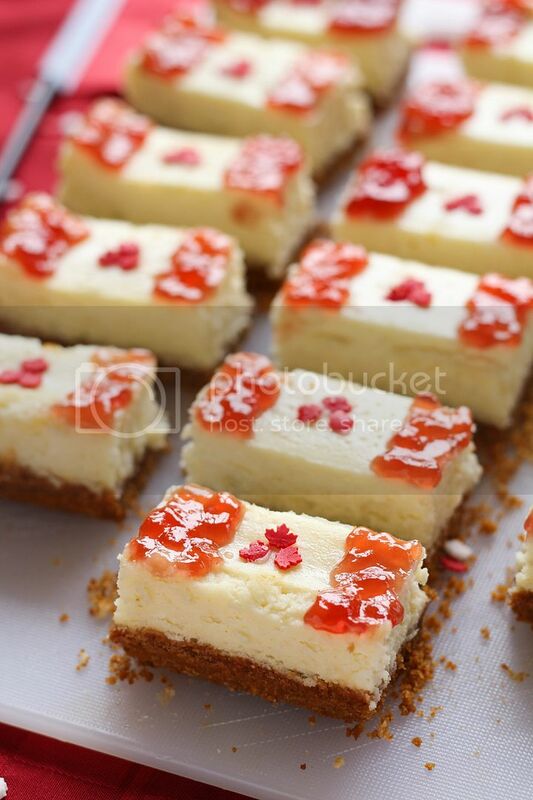 Stir jam first, then use a small butter knife or spoon to spread strawberry jam on the edges of each rectangle to resemble the Canada flag. Use enough jam so it shows up well but not too much that it will fall off – you’ll get a feel for what amount to use after a couple tries. Place three Canada leaf quins in the center to complete the flag (or if you don’t have any, you could use a blob of jam or red sprinkles if you can shape it into something that resembles a maple leaf!). Keep bars refrigerated until ready to serve. Don’t decorate them more than a day ahead.